If you are, or have ever been interested in archery, then chances are you are going to be interested in some of its history. It is an ancient sport based on the simple use of equipment like the bow and arrow. The first use of this type of equipment has been dated back to Germany going as far back as 10,000 to 9000 BC, with some recent evidence are pointing to arrows being used as far back as 64,000 BC. As one can imagine, the progression of the bow and arrow has come along way since this era. In regards to the bows, it appears they can be traced back to Denmark to the Holmegard swamp and the bows are believed to have replaced the sphere throwers. 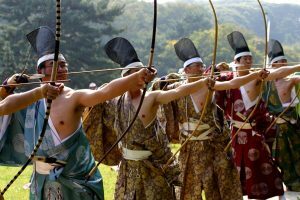 Over time, archery itself was further developed in Asia. While archery is viewed by most as an activity that takes place on the ground, mounted archery cannot be overlooked. This is in reference to archery that is performed on horseback. Most will equate this to the western movies they used to watch with the cowboys and Indians. Although the bow and arrow eventually became replaced with the introduction and use of firearms,archery did eventually become popular again mostly in the form of recreation with it eventually working its way into the sporting venues. This introduction of archery as a sport became evident again in the 1840s. During this time the Grand National Archery Society came into being and new rules for archery were implemented. New techniques were also developed over the next few decades. Despite the emergence of newer sports and technology, the sport of archery managed to hold on. Around 1889 there were only about 50 clubs for archery still in existence in Britain but the 1900 Paris Olympics still added this sport to its roster. Having an interest in archery means that one who wants to participate in this sport has some learning to do.